I have known Andy Spence for many years. He has always been someone who treads lightly on the environment. His Cut n Paste products are a result of smart innovation and years of experience working in parks and reserves where undertaking weed control amongst non target native species requires careful use of agrichemicals. Andy also understands that many people are wary of herbicides and ensures that only that amount of active ingredient that is absolutely necessary is contained in his products. A significant advantage of Cut n Paste products is their ease of use and compact nature. A significant advantage of Cut n Paste products is their ease of use and compact nature. The applicators are compact enough to easily carry a few in the field. 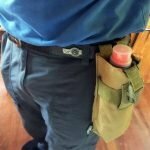 They are also easy to refill and re-use. We appreciate that additional caps, brushes and bottles can also be purchased. My confidence in Andy’s products is based on knowing that every product has been rigorously and methodically tested in the field by people who know what they are doing. Additionally Andy is always up front if there is an issue with a product and has no hesitation in replacing any stock – this is not a common occurrence however! The Cut n Paste team are also great to deal with. Personalised service, cost effective products. Product always arrives on time, new and improved products are made available as soon as the team are happy with their performance and they are always open to suggestions on improvements from clients. Cut n Paste ‘walk the talk’ – what they say their products can do is always on the money. 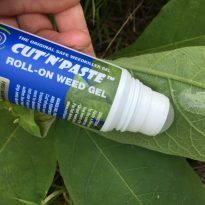 Cut n Paste is a key weapon in Treescape Environmental’s weed work toolbox. I have been using Cut’n’Paste on a diverse range of environmental weeds since March 2011. Key species include woolly nightshade (Solanum mauritianum) and moth plant (Araujia hortorum). I have found that cutting as close to soil level as possible and pasting with Cut’N’Paste gel has given excellent results with no lateral movement of herbicide in the ground. The company Landman Limited has given excellent customer satisfaction since lodging my initial order in 2011. Well the trials of Lawn Raider we have done have worked very well, clients are pleased to see the paspalum plants disappearing out of their lawns. We at Seascapes Waiheke have switched over to your fab cut and paste and have had great success on ginger and bamboo. As a weed control contractor for over 14 years I have used every type of herbicide for controlling weeds. I trialled Cut’n’paste in my business and found it to be effective in controlling a range of brush weeds such as Chinese privet, tree privet, woolly nightshade, gorse, monkey apple and evergreen buckthorn. The fact that it can achieve results with the lowest toxicity Glyphosate in its formulation just increases its worth in the battle against weeds. 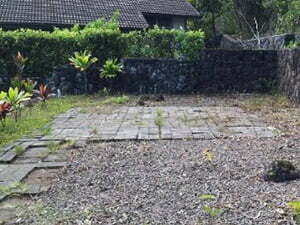 I have no hesitation in recommending this product to other contractors and to homeowners. We’ve been using your product from a 20l container. It works fantastically. I thought I would take the time to drop you a quick line about Cut’n’Paste. The greenstaff here at Peninsula Golf Club have sucessfully using Cut’n’Paste to remove unwanted Paspalum grass and reeds throughout the golf course. We have been using Cut’n’Paste to remove Paspalum from our couch grass fairways. 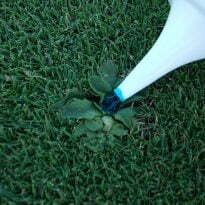 We carefully wipe the product onto Paspalum leaves and target kill off without seriously affecting the grass underneath. 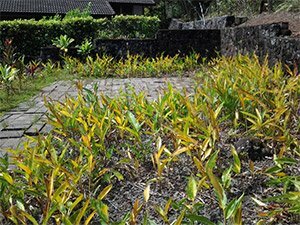 As the Paspalum dies off the couch grass underneth can begin to grow susessfully with little or no damage. Cut’n’Paste was convenient, saved time for maintenance staff because they could just act as and when there was a weed that needed to be dealt to. That it was highly targeted on those nuisance course weeds. Cut’n’Paste saved money because we did not have to invest time and resources into expensive chemicals which may require a follow up application. Staff could treat weeds as and when they identified them. We now succesfully use Cut’n’Paste because I wanted a safe low toxicity product and with the applicator brush was easy to use. Cut’n’Paste fits this criteria of being low cost and easy to use and with the addition of blue dye is now visible for the green staff to know where they have been. We are mainly targeting paspalum and results are noticed within 7 day period of time with the plants wilting and dieing. As an added extra Cut’n’Paste will also deal with all the other nuisance weeds around the course, the gorse, wooly nightshade, paspalum and reeds have all been controlled successfully. I better send you this before I lose the list! I did a test batch of evil plants, or, I should say, evil in the wrong place plants, plants that are trying hard to win their official ‘weed’ certification, cutting them as close to the ground as possible, and smearing a coat on the exposed cut surface. A stand of 6 Tamarisk, and a group of Russian Olive, (5) this was done in June, late spring, and by end of October, right before the first freeze, there was no growth. These plants were by the Jordan river, (no not that one, Jesus never heard of this place) where they had plenty of water, I was told that one of these plants can take 200 gallons of water a day, so do the math, and see the effects in the arid west. There were Honey Locust, (a tree) about 10 of these, about 7 Box Elder, and Some Siberian Elm, all of these were treated, mid summer, and they all seem to have decided to take permenent residence in that glorious garden in the sky. The wood seems dead, and I think that they all will just rot away. As Utah only gets about 28 CM of rain a year here, it may take longer than you are used to. This stuff is good on things that sucker. There was also a bush, with about 4 cm thorns, that bit the dust, also. My friend, Gina, the garden lady, and a professonal gardener, also used C n’ P, and she liked it enough to appropriate what was left, and will use it when she returns from Costa Rica. I picked up your pamphlet from a friend’s table a year ago while wondering what I was going to do about the infestation of weeds on my two and a half hectare property. 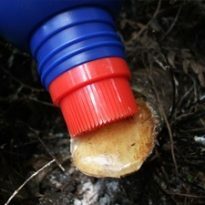 I am very happy to say that results were immediate and within one year all weeds including moth plant, woolly nightshade, pampas grass, tobacco plant, jasmine- you name it, have completely disappeared using Cut’n’Paste Gel. The product is easy to use and safe to surrounding plants. Your professional “Land Man” advice along the way regarding new plantings and attraction of bird and insect lifehas been invaluable and ongoing. So, I am very glad to have picked up that particular pamphlet. Hi, my wife purchased a bottle of Cut’N’Paste double strength from you at Rangihoua during the garden safari and it has been great on the bamboo on our roadside. I bought your Cut N Paste only a couple of weeks ago! I’m wreaking havoc on our rubber-tree plants. I saw it at Placies and asked the girl if it was “Andy’s product” and she said it was and that it was really good. So there you go! This is to say how delighted I have been with the results of using Cut’n’Paste Herbicide Gel to get rid of jasmine on our section. The jasmine had wound itself through a stand of flax and some other treasured natives, and we were faced with how to remove the jasmine without harm to the other plants. By snipping some of the jasmine vines, tying the rooted ends together where possible and applying the gel to them and just leaving it to work, we now have an excellent result. The jasmine has turned brown and died off all in amongst the flax, etc., but the natives remain green and healthy. After clearing an extensive area of gorse I applied Cut’n’Paste to the cut stumps of the gorse which were up to 10 cm in diameter. CutnPaste was very easy to apply, and a lot easier to handle and contain than spray. After 2 months I checked the stumps – all have died and there is no regrowth. This has been a very effective treatment, and has saved the hassle of needing to respray. CutnPaste is a great product. I have been using Cut’n’paste on a variety of different plans – it works a dream. I am generally an organic girl and don’t use any chemical on my food or cosmetics or anything that touches or goes into my body. But I have also found that I just can’t get rid of some weeds manually or with natural sprays – like kikuyu, asparagus weed, bindweed (convulvulus) Japanese honeysuckle, etc. What I like most about it is, how easy it to use and how specific it is. I can use it on a plant right next to a rose bush or amidst other plants and as long as I make sure I don’t touch them it only kills the plant I want to get rid of. So it makes it as ‘safe’ as possible to use. even If I have touched another plant by accident, just breaking the affected leaf off is enough to stop it from being killed accidentally. I can highly reccommend it! We have been stocking Cut n Paste and Bamboo Buster for the last two years, here at Placemakers Garden Centre on Waiheke. They are very effective products, easy to use. 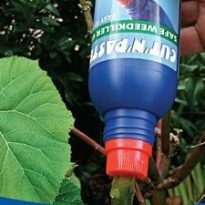 I have used Cut’n’Paste at home on very hard to kill shrubs , such as Bouganvillea and was very impressed at how quickly it worked. We sell it very well and feel it is a well suited product to our shelves. I would not hesitate to recommend it being stocked, in any of our stores. We highly recommend Cut’n’Paste and are very proud that Andy developed it on Waiheke Island. Results are fantastic. The cost is extremely competitive, and it is better for the environment than comparable products. We have used Cut ‘n’ Paste on our jobs successfully; just one month after application the weeds are drying out and dying. This product has been extremely effective in that we have had no regrowth where applied which has been around the edges and on the area cut. It has been easy to use and we would highly recommend this product. Bamboo calls for a special kind of killer! There are some plants such as bamboo and privet that are hard to eradicate from your gardens. Take bamboo for instance. You may have seen a cute bamboo plant in a container at a garden centre and thought that it would be nice to have your own little stand of this cane plant. It would be great to be able to pick your own bamboo stakes for free. So with no more thought you purchase the cute plant. A few years later you find you have released a monster into your garden. Sometimes one inherits a stand of bamboo when buying a new home and you wonder later on if the previous owners only sold the house to be rid of the bamboo. This week I was informed by the manufacturer (here in New Zealand on Waiheke Island) of the dab-on weed killer Cut’n’Paste that they had a new formulation called Bamboo Buster, that is stronger than the original. Here’s what I learnt: Bamboo Buster is designed to tackle those toughest of all weeds, bamboo. There are more than 1000 species of bamboo in existence. Some spread like wildfire and are much more of a problem weed than others and while many are not in New Zealand there are a great number of different types that cause problems for landowners. Clumping varieties in general cause fewer problems than those with long underground rhizomes that can spread, rapidly damaging decks, water tanks, concrete paths etc. They are often very hard to get rid of. Bamboo Buster has been trialled on a number of different species with very satisfactory results. Some species may require several follow-up treatments until all vigour has gone from the root systems and no more shoots reappear. Where deformed new growth appears from old stumps, cut and paste the leaves of the many little stems. There are other more toxic methods of killing bamboo, some of which are more immediately effective but they have long-term residual effects on the soil and other plants nearby. 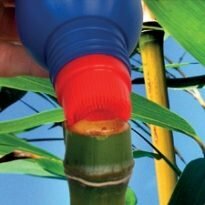 Bamboo Buster gives you the ability to tackle your bamboo without spoiling your soil. Bamboo Buster is also great on all those very tough woody weeds like chinese privet, tree privet, Rhamnus alternus (evergreen buckthorn), willow, gorse, barberry, hawthorn and other vigorous coppicing shrub weeds and trees. For bamboo species, cut near to the ground, just above a node. Paste the entire cut surface and into the hollow in the middle of the stem. Don’t skimp with the gel – apply a generous layer of paste to the whole area of the cut stem. Take your time and apply with care and it will pay dividends. Make sure you apply the paste as quickly as possible after cutting. That means immediately. 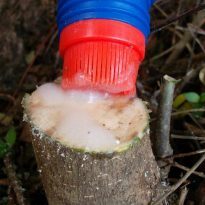 When stems are cut the plant quickly withdraws its sap and seals the cut. When the paste is applied immediately it enters the plant most effectively. Ensure that the whole cut surface is covered. When part is left a section of the stem can remain alive. The ideal methodology is one person cutting, one clearing away cut stems and one pasting. By using a third person whose job is simply to apply the paste in the way recommended you will get the best results. When outlying bamboo shoots are treated the dieback can reach some distance into a neighbouring clump of bamboo as the effect travels along underground root systems (rhizomes). Like Cut’n’Paste, Bamboo Buster is still very low toxicity to animals whilst being very effective on your weeds. At the lowest herbicide hazard classification of 9.1D, Bamboo Buster is not classed as dangerous goods. Bamboo Buster is available in 450ml bottles from some garden centres or from our online store. From Hawaii: Killing their Ginger nightmare! I am belatedly reporting that your cut n paste seemed to work well to stop a chainsawn 100mm diameter willow from resprouting. Nice to hear from you and to hear of your new products. I enjoy using your product and tidying our special wetland of the nasty weeds. The volunteers are happy and safe using your product. As you have already seen I have added many pictures to our facebook page of the volunteers using your bamboo buster (www.facebook.com/sinclairwetlands). It is great to be able to support a local product and I have encouraged my boss at my other job to make the switch from Vigilant to Cut’n’Paste and have just ordered a 5L of bamboo buster on behalf of “Penguin Place – Dunedin” – your email and discount code came at perfect timing, as I was encouraging them to trial your products. I team your Cut’n’Paste up with bumbags custom built by “cactus equipment” in Christchurch, they sponsored us with 10 of the bags to assist our effort to maintain Sinclair Wetlands – perhaps you might like to spread the word to other customers… they make a great way of housing secateurs and they fit your bottles well for hands free navigation. If you would also be interested in sponsoring Sinclair Wetlands with some products it would be great to hear from you. We have used Cut’n’Paste on our property for more than a year now and are genuinely impressed with the results. “Our Ginger is gone! Within a couple of months of treatment the plants had withered and died off and they haven’t come back. Agapanthus died in just the same way. It shriveled up and died. This is so much easier than having to dig it out and find somewhere to dump the root mass. Most astonishing to us is the result of some large and difficult to control Lantana plants. Some we cut and painted the stumps and with only one minor touch up of some shoots that were missed the smaller plants were dead. One large Lantana tree was so bound up and interlocked with other trees that we didn’t want to cut it down. We simply scratched the bark at the base of the tree with a wire brush, and then applied Cut’n’Paste. Within a couple of months the tree was dead and we left it to fall apart in time. This saves heaps of time, energy and hassle. We are very impressed with Cut’n’Paste. Another plus isn’t the collateral damage you get from spraying. We find it very easy and safe to use. We would recommend it to anybody with a garden as an essential tool for making weed control simpler and easier. pleased with the results to date. copice growth. 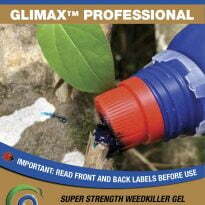 I have also used it on Populus stumps and Salix stumps. sucker regrowth with the poplars. After spraying an area of bamboo in the corner of our property a couple of times I have been using CUT’N’PASTE double strength Bamboo Buster on the regrowth with great success. It is easy to apply directly to the plant. A great product. I used Cut’n’Paste to control some well established noxious weeds. It was easy to use – very effective and crucially there was no damage to nearby sensitive plants.